Are you suffering from dislodged teeth? If so you should contact your emergency dentist right away. The quicker you receive treatment the greater the chance of saving the tooth. So what exactly is a dislodged tooth anyhow and how can it happen? A tooth that has been dislodged is a tooth which has been pushed into, out of, or sideways from its socket. This is usually due to an injury or blow to the face. When this happens you need to contact your Manchester emergency dentist right away. (B) When the tooth is pushed right up into the gum. Sometimes the tooth is pushed sideways and when this happens it may also cause damage to the teeth nearby. Unfortunately dislodged teeth are all too common among children, so it’s good for parents to have an understanding of what actions to take in this emergency. To have the best chance of saving the tooth it’s important you visit us straight away as leaving the tooth untreated may result in further damage. Whether this is 3am on a Sunday morning or 9pm on a weekday evening, contact your Manchester emergency dentist right away. What should I do if my tooth is dislodged? First thing to do is to try not to panic. Stay calm, call us, and arrange to come and see us as quickly as you can. This is so that we can reinsert the tooth properly and to help prevent any infection. In the meantime, try not to touch the tooth, even if it is partly out of the socket, as this may loosen it further. A dislodged tooth can be painful so you may want to take some over-the-counter pain killers and/or use an ice pack to reduce any swelling. 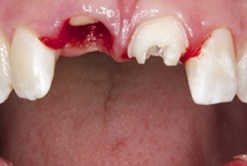 How do we treat a dislodged tooth? After taking a look, and determining if the tooth is still alive and can be saved, we’ll clean the area under local anaesthetic. After taking an X-ray, we may use a splint to hold the tooth back in position, utilising the healthy teeth either side of the problem area. This allows the gum to heal over and the tooth to eventually become stable again. However, if the blood supply and nerves have been badly damaged, you may need root canal treatment and this should be done within a few days of the injury. This will help prevent infection and an abscess forming. Root canal treatment involves taking out the tooth pulp, flushing out the inside of the tooth, and sealing it with a filling material. Following healing, you may then need a dental crown. What happens if my tooth can’t be saved? Occasionally, there may be too much damage to the tooth for it to be saved. As a result it will need removing. If this is the case, the missing tooth can be replaced by a denture, bridge, or dental implant. This will restore your confidence, especially if the affected tooth is in your smile line. We can discuss these options with you after treatment and see which is best suited to you. Accidents do happen and dislodging teeth is not always preventable, but if you play contact sports, please make sure that you always wear your mouth guard! 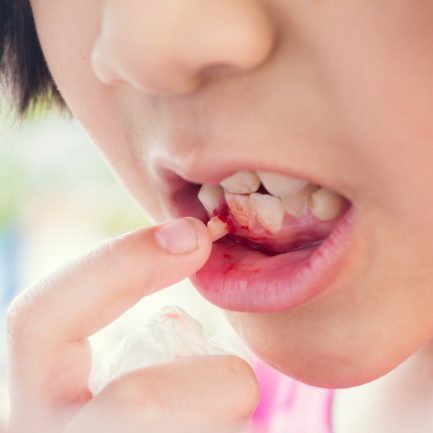 While dislodged teeth can be distressing and painful, please follow the advice above and call us straight away for dislodged teeth repair on 0161 485 7376.